• Tarp opens from the front or back to fully expose top or rear deck for overhead loading by crane, or forklift loading from either side or rear. • 4 heavy duty load levelers and ramps with 23,500 pound (10,500 kg) load capacity rating per axle. 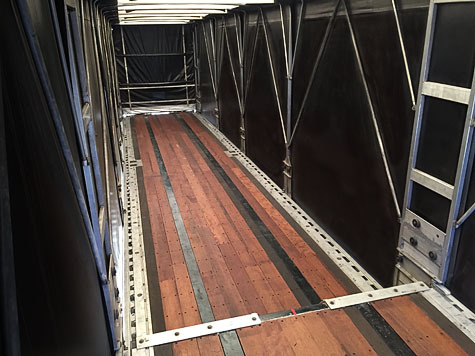 • Ramps can also be used under the trailer tires to bring the trailer deck up to loading a 48 inch dock height. • Team expedited service and dual driver protection service. • Both drivers are US Citizens with passports, plus AA&E, TWIC, TSA, HazMat and tanker endorsements. • USA & Canada cell, e-mail and Internet service. Same cell number for both countries. 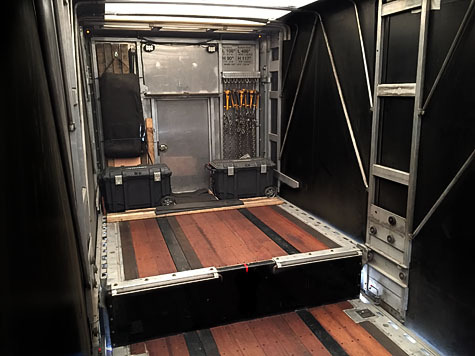 Ramps securely lock to both the top and bottom trailer deck and have 2 adjustable jack stands. Allows us to accommodate vehicles with a long wheelbase or low clearance, such as these mini vans modified with wheelchair ramps. 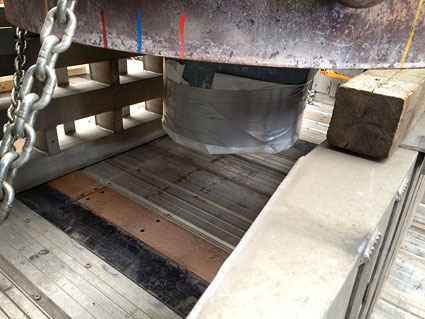 The four ramps can also be used as very secure load levelers. 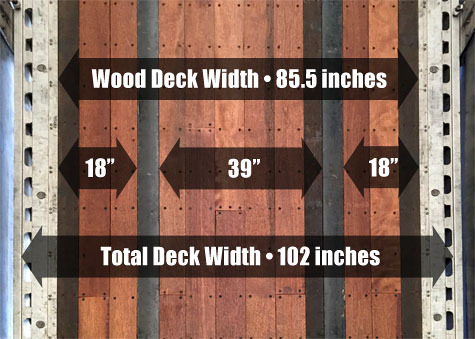 Longer pieces can span the entire 49.5 foot length of the top and bottom deck. Allows for more loading flexibility and greater capacity with usable cargo space between the levelers. 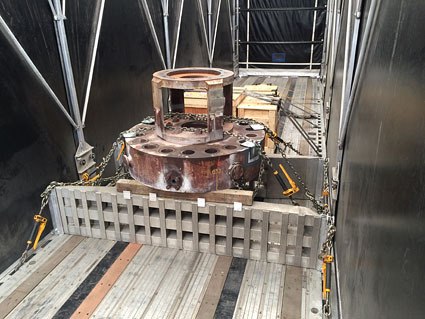 Load Levelers can also be used to secure odd shaped cargo. This custom valve was secured on the levelers, allowing the important valve on the bottom to travel secure without damage. Tarp rolls open from the front or back, allowing easy access to deck space from 3 sides with a forklift, from the top with a crane, or from a dock. 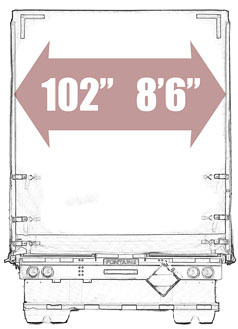 Rear axle can slide to the back, and ramps can be placed under the trailer tires to bring the deck up to at least a 46 inch dock height for easy drive on access.